Not everyone knows that Automated Gates do not have to have a safety shut off to stop them closing on people. Of course most of them do stop and even reopen if the sensor beam is broken, but not all of them do this. 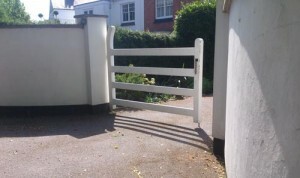 We have been made aware of Gate Safe, which is an organisation that is campaigning to make all automatic gates include this safety feature, and to have legislation passed to ensure that all automatic gate installers are registered to prove that they are competent to fit the gates in a safe way and with safeguards in place. Gate Safe was set up following the avoidable deaths of two children in separate incidents in 2010, who were crushed in automated gates. Three children were injured by automated gates in the same year, and the founders of Gate Safe felt they could not stand by and allow this to happen. They aim to change guidelines for installers and suppliers to ensure that gates have safety mechanisms built in and that they are installed in such a way that they work effectively if someone gets caught in the gate as it closes. They want to stop any further fatalities or injuries caused by automatic gates. If you are thinking of getting an automated gate fitted or maintained you can ask to installers who are registered with Gate Sate, for peace of mind that the installer will be aware of the safety requirements and will have passed the training necessary to make sure your gate operates safely. If you are an installer of automated gates and you want to find out more about training courses and Gate Safe accreditation you can visit the website to find out more. If you think you have an unsafe Automated Gate then get in touch with Gate Safe for help and advice. Is Your Energy Bill Getting You Into Hot Water?